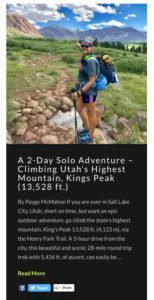 If you are ever in Salt Lake City, Utah, short on time, but want an epic outdoor adventure, go climb the state’s highest mountain, King’s Peak 13,528 ft. (4,123 m), via the Henry Fork Trail. 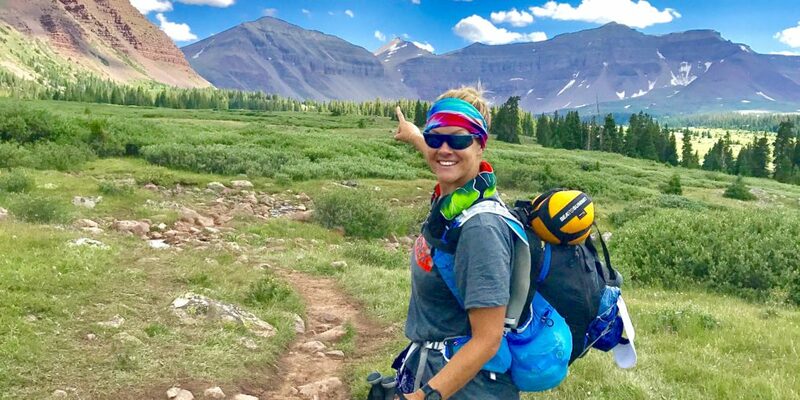 A 3-hour drive from the city, this beautiful and scenic 28-mile round trip trek with 5,436 ft. of ascent, can easily be done in 2-days. 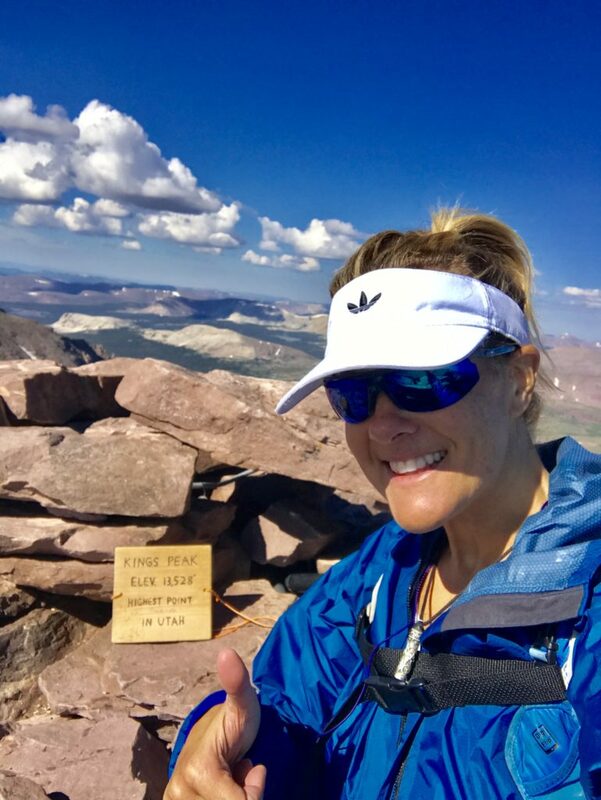 Located in the High Uinta Wilderness Area of the Ashley and Wasatch National Forest, Kings Peak is the seventh highest of the fifty U.S. highpoints (highest point in each state). 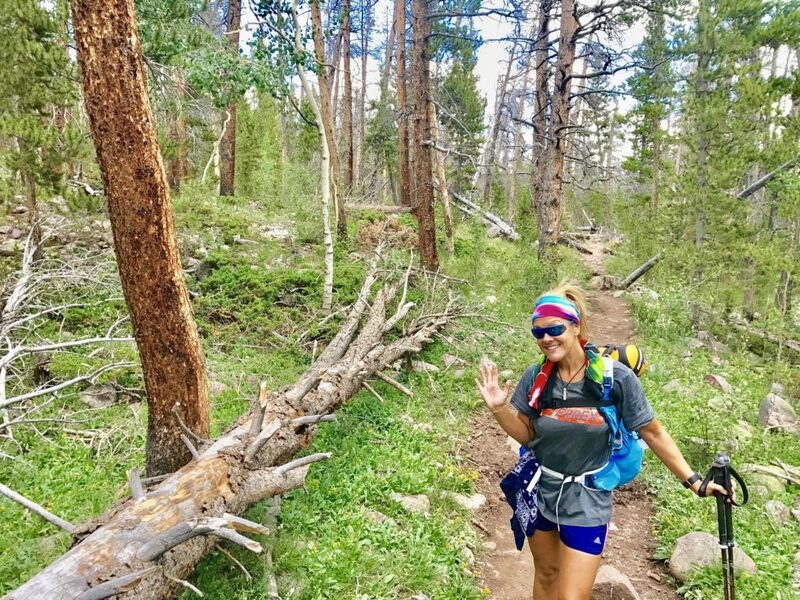 I chose the Henry Forks Trail, a popular route, because I was trekking solo in bear and moose country. Wild animals tend to avoid people and noise and if I ran into trouble or hurt myself, the odds were good someone would eventually come along. 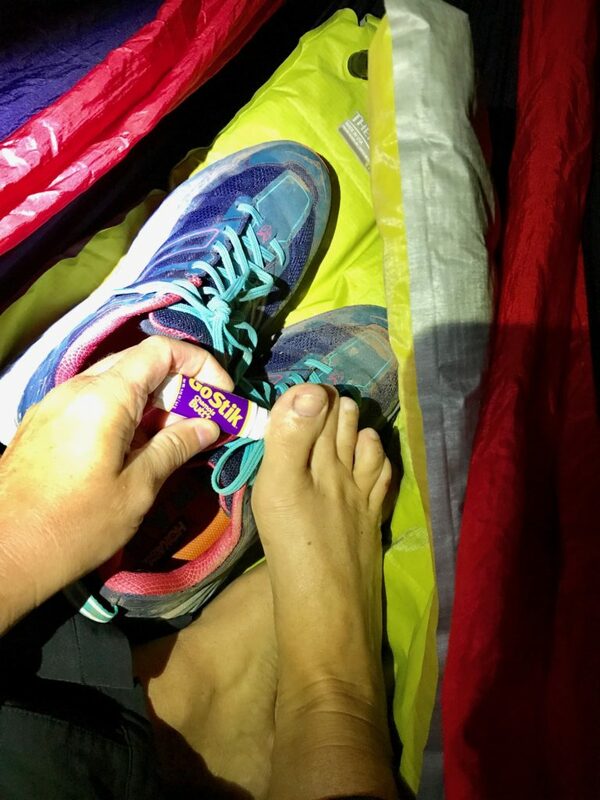 Food – PB&J sandwiches, TME Bars, PowerBar Chews, Untapped Maple Waffles and powdered Gatorade. *Verizon has the best coverage in the U.S., but even on this trail the only time I had a bar or two was on the summit of Kings Peak. 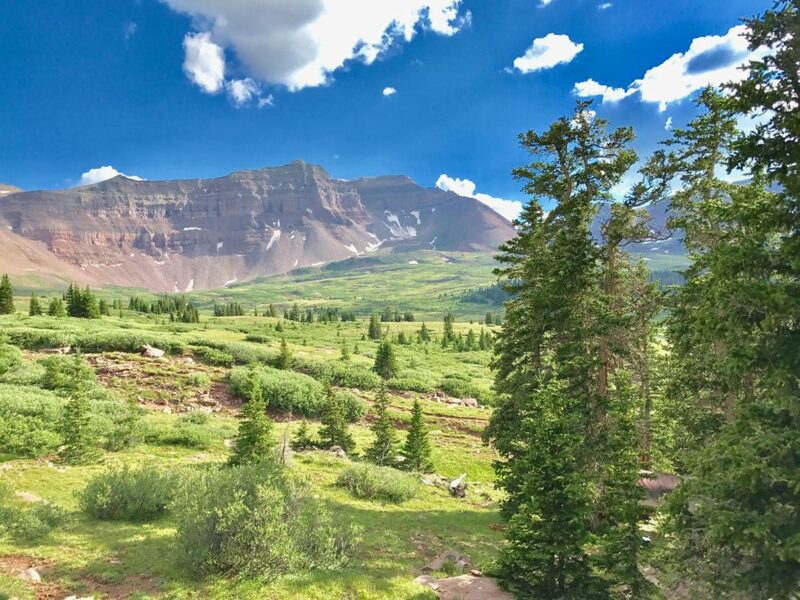 On a sunny, Saturday in July, I arrived at the remote trailhead parking lot around 1pm. I spoke with a few backpackers finishing their trek to get a better idea of current conditions, weather, animals, water sources and pacing. Don’t get me wrong, I did research and read blogs beforehand, but its always good to get up-to-date information. They told me it had hailed the night before, but today looked good. Rain was expected later tomorrow. There were no bear sightings, but a ranger had spotted a couple moose off trail. No worries. 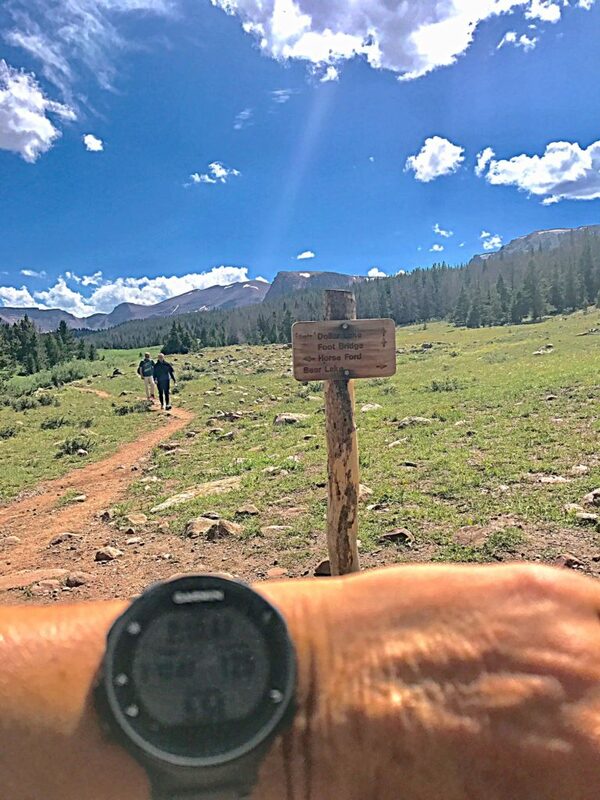 I wore a Garmin to track distance as trip reports differed between 27-30 miles RT. After signing the trail register and putting a note on my rental car’s dashboard with my name, destination, estimated date of return and emergency contact information, I put on my pack, grabbed my Leki trekking poles - with duct tape wrapped around them (ya never know when you’ll need duct tape! )- and started hiking. 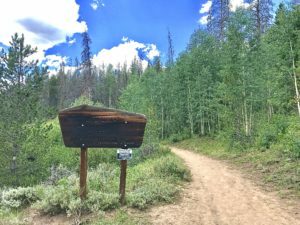 Following signs towards Dollar Lake, The Henry Forks Trail is mostly flat for the first 8-9 miles. Starting at an elevation of 9,420 ft., it meanders through a forest filled with Douglas Fir, aspen, spruce and pine trees. Their sweet aroma is pleasant and reminds me of why I love hiking out West. My slightly higher heart rate and breathlessness remind me, I live at sea-level. At 3-miles in, I should have run into Alligator Lake. While I did not actually see the lake, at that distance (it is farther left of the trail), there was a rushing stream and a great place to refill water. 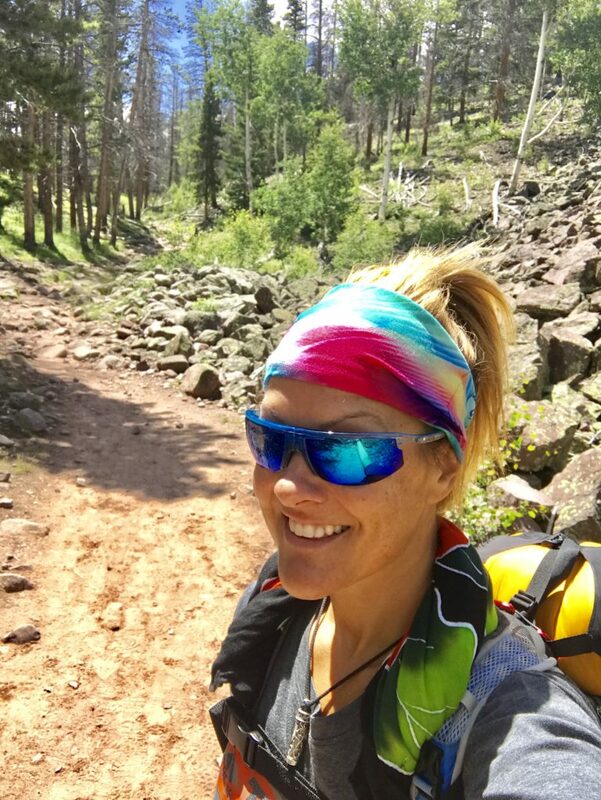 Side Note: When it comes to hiking alone, I am an experienced backpacker, have been trained in wilderness survival and keep aware of my surroundings. People fear what they do not know or understand. Research and experience is key. Statistically, animal attacks are rare. My biggest concern is lightening. While I do not wear a SPOT location device, I make sure people know where I am going and how long I’m expected to be there. 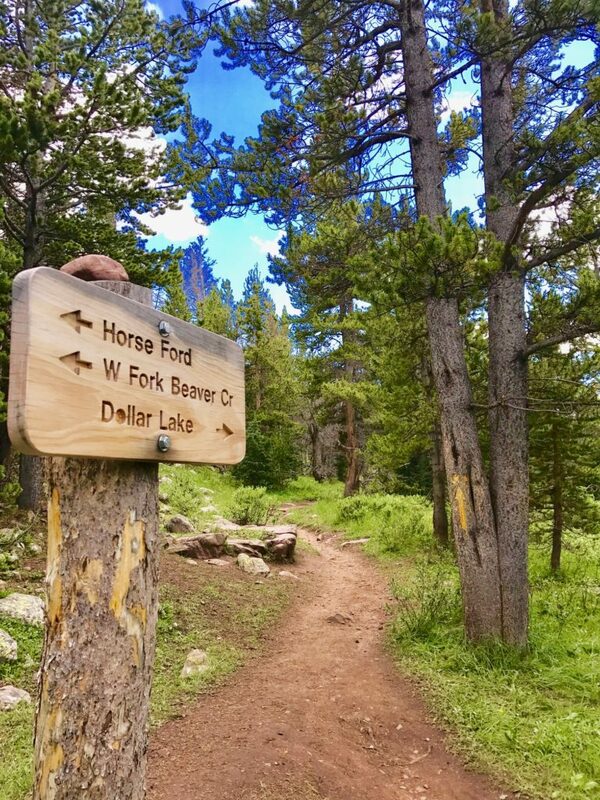 At 5.5-miles, as indicated in reports, I reach a fork in the trail with a sign pointing towards Dollar Lake (8-miles from trailhead and a popular camping spot with fire restrictions). It is the first trail marker/sign I’ve found and like the others to follow, mileage is never indicated. 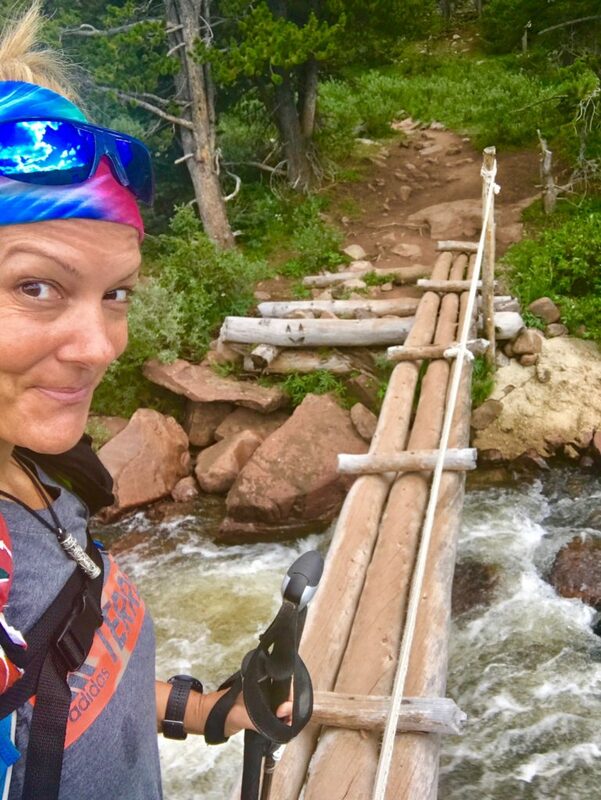 There, I amble over a narrow, wooden bridge at Elkhorn Crossing and follow another sign, pointing me in the right direction. 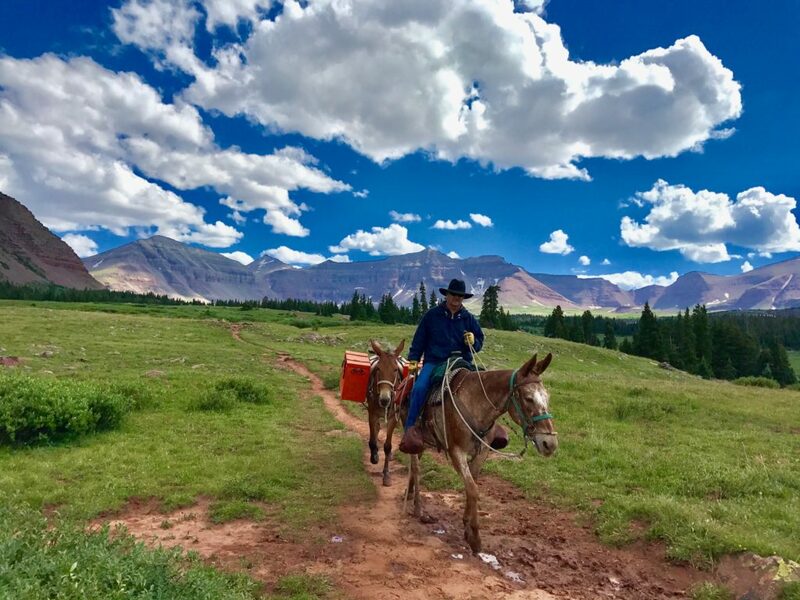 The trail opens into a scenic, grassy plateau with pockets of trees, framed by mountains. I can see Kings Peak for the first time. Passing on camping at Dollar Lake and I found a beautiful spot right after the trail sign for Gunsight Pass. 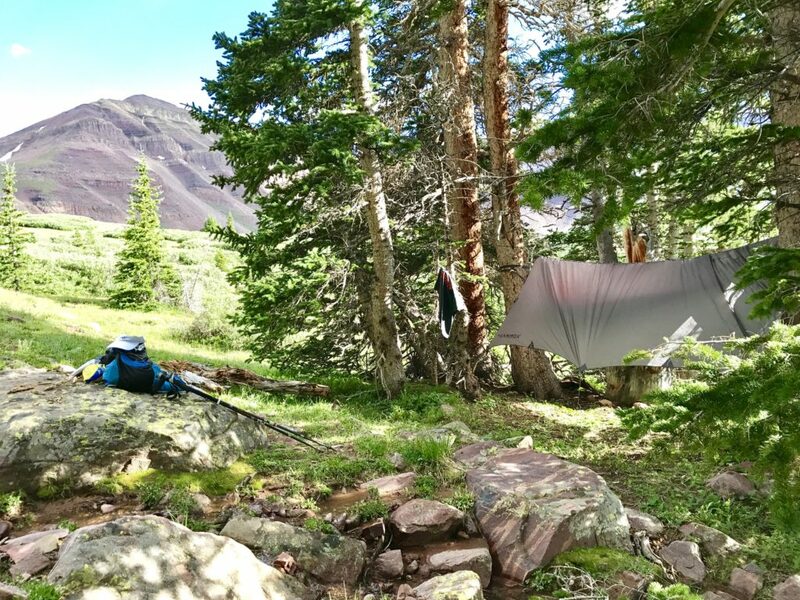 I nestled my hammock between a couple aspen and a nearby creek. By 6pm, I was eating a PB&J sandwich, relaxing and enjoying the views. Tomorrow was going to be a long day. It didn’t rain and temperatures dipped below 40F that night. I slept great and was up and on the trail by 5:45am. 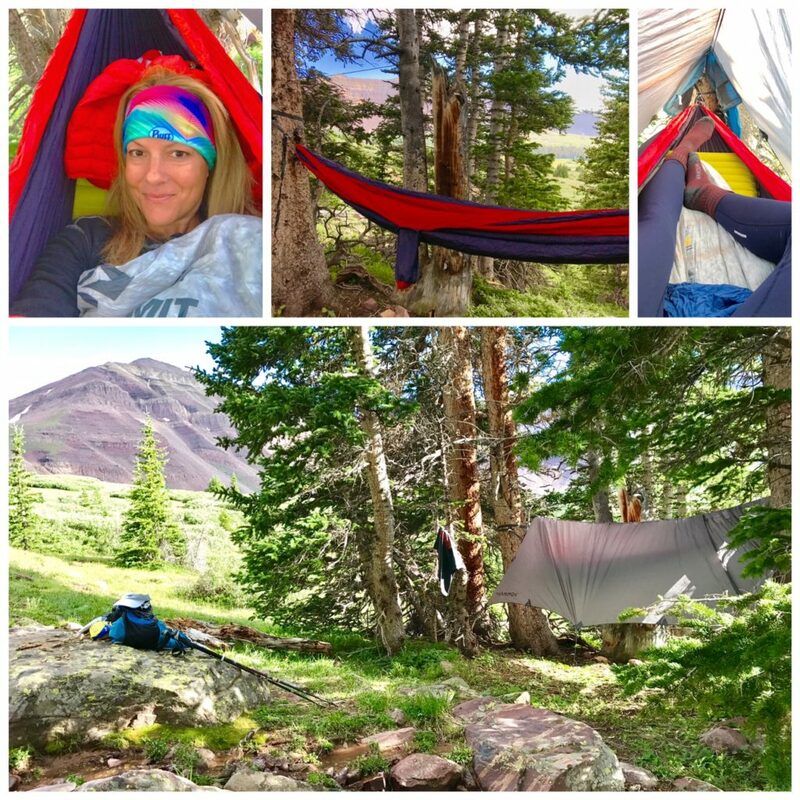 To reduce pack weight, I left my hammock, tarp, sleeping bag and mat at the camp site. I’d retrieve them later. I made it up and over rocky 11,900 ft. Gunsight Pass, about 9.5-miles from the trailhead, in less than an hour. 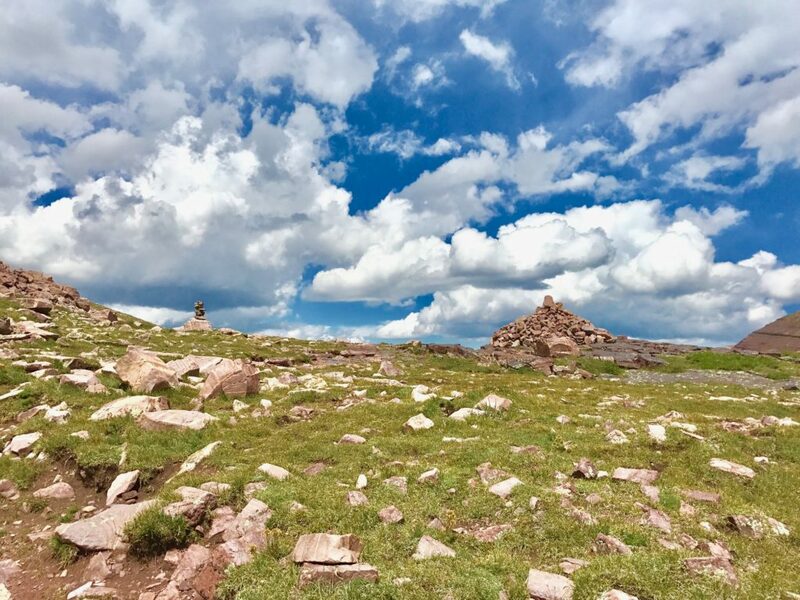 Following cairn, the trail dips into a valley, winds around a talus slope and starts to ascend again between Kings Peak’s east face, and the south face of the Highline ridge. Passing large patches of snow and run-off streams of water, I reach the last mile to the summit. It is a steep climb and scramble over boulders and rocks. There is no real path marked, so I just kept going up. This last push took me well over an hour. I reached the summit at 10 am. I had it all to myself and the views were spectacular! Still having 14-miles to hike that day, I only spent a half-hour at the top. Dark clouds were accumulating in the distance. I took a more direct, steeper route down. Some of the boulders were unstable and it made me question by decision, but it saved a mile. I made it back to camp, hurriedly packed my things and kept going. I got rained on and thunder echoed behind me, but thankfully, no lightening. When I reached the trailhead, the skies were clear and it was 5pm. 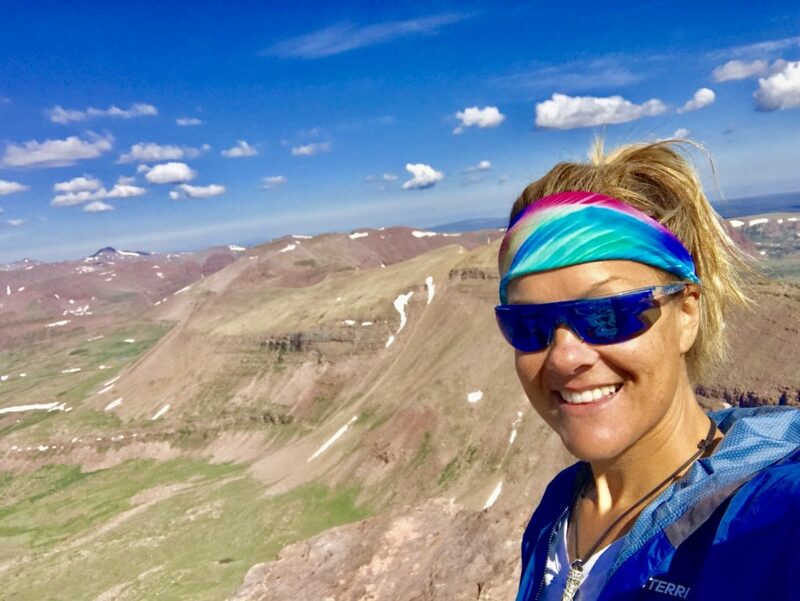 My Garmin logged 27-miles and my legs felt every single one. The scenery, trail and summit were worth it!